Are You Ready? 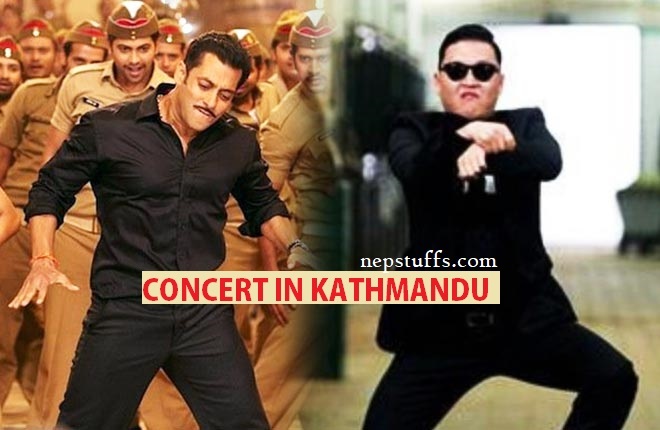 Psy And Salman Khan Are Coming To Kathmandu !! K-pop star Psy and Bollywood heartthrob Salman Khan are coming to Nepal soon. Psy is performing his ‘Gangnam Style’ concert on 15th December at Satdobato, Lalitpur and Salman’s concert likely to be held in coming March, 2019. But, both organizers are facing same kind of immense challenge right now. There is lack of ‘Reliability’ among people regarding the organizer and their high-profile concert, thanks to Salman Khan’s two time failure concert due to many reasons. An owner of Khan’s Dabangg Concert’s event management company ODC, Simant Gurung nabbed by police after the date of concert postponed by two times. Now, they are planning to bring Salman in March and releasing Khan’s video footage soon. Same challenge is facing by Psy organizer here at Kathmandu. They are planning to organize press meet soon with the video message of Psy and other stars of K-pop. Question is will they able to organize the concert safely and in time? If that happens, Nepal will get immense benefit from world stars in global arena.